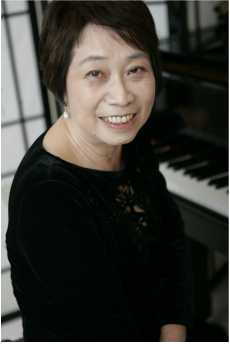 Alice Tsai graduated from Chinese Culture University with a degree in Music Education and Piano Performance. As a student, Alice accompanied and conducted a children’s choir for 7 years. During that time, she led the choir on two tours of Japan. She has also conducted various adult choirs for more than 20 years. Alice is also passionate about training church pianists. Since moving to Irvine in 1996, Alice received her Masters degree in Church Music, specializing in Piano Performance. She has studied under Dennis Alexander, Cecilia Grose, Dr. Julie Wong, and Dr. Felix Tao Chang. She also serves as a board member of Music Teachers Association of California (MTAC). Every year, her students receive outstanding recognition in Certification of Merit exams, and routinely perform in honor and state conventions. Alice has enjoyed many years of teaching countless students, ranging from 4-year-olds to adults seeking to fulfill childhood dreams. Alice believes that learning piano should be a happy experience, and that every child has the potential to become a musician. The responsibility of the teacher is to pull the inner music out of the student; moreover, all musical hardships, challenges, and struggles can be overcome with proper guidance and training. In the end, one can enjoy the accomplishment and joy of playing piano. It is without a doubt very important to learn proper technique, but more important is the attitude of learning and what it cultivates -- patience, persistence, concentration, attention-to-detail, self-control, appreciation of music and beauty -- that can truly transform music into a part of our lives. Even when a student no longer practices piano, they are still able to recall the beauty of learning how to play.